Moving is a multi-step process, and can be very stressful, especially when you’re not organized; here at Boston’s Rare Movers, we are all about customer service, and helping our clients with every step of their move! That of course, includes the actual moving part, packing, unpacking, loading the truck, and getting them to their new location on time, and with everything still in tact. We’ve been in the moving industry for many years now, and we’ve seen all of the ups and downs to moving. Before you begin moving, or even think about moving, you should find a new job first. There is nothing worse than moving to a new city or state, without having a job lined up; you want to be sure you can afford the new location and that there is a job that utilizes your skills and interests. Moving is a pretty big step, make sure you’re mentally, physically and financially ready for the change! For more information, or a free estimate, please give Boston’s Rare Movers a call at 617-825-7273. Moving to or from Boston? Boston Rare Movers is the moving company for you! Over the past month alone, we have been in and out of Boston, moving people into and out of homes and offices. Just last week, we moved a family from Boston’s Back Bay, to a quiet neighborhood in Weston MA. This family had two children, and were planning on having more; they told us they needed a bigger house to accommodate their growing family. They decided on moving into a fairly new built house in a quiet Boston Suburb. They actually had a lot of belongings they were bringing to their new location; we’re talking everything from a fridge, to big screen televisions, couches, beds, and even a crib! But despite all of the heavy lifting, we were able to successfully move everything into their new home. The family was so busy with preparing the new house, that they needed our packing services. We brought our boxes, packing tape and markers, and began packing up their belongings. We were sure to label each box, to make the unpacking portion of the move easy and stress-free for the family. We were able to move everything on time and within budget! Before the family new it, they were all settled into their new home! 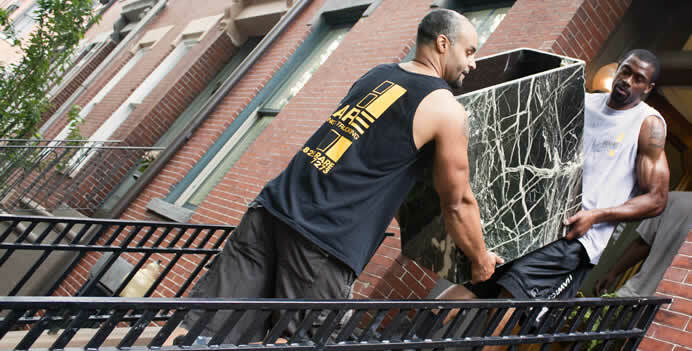 For a free estimate on our moving services, please feel free to give Boston Rare Movers a call at 617-825-7273. We are looking forward to helping you with your next moving needs! Moving can be very stressful, which is why we do everything we can, here at Rare Movers, to ease the stress of all our moving clients. One way we can ease the tension come moving day, is by giving expert advice on packing; we’ve been moving a long time, and we know all there is to know about moving and packing. First thing’s first, start packing up the items you don’t need well in advance to moving day; for example, since it’s summer, pack up your winter clothes, coats, gloves, shovels, etc. Pack up books, and old files you don’t really need at the exact moment. Next, organize what you pack by the room they belong to; so you should start with spare rooms, and work your way up to the more important rooms like your bedroom, kitchen and living room. After you finish packing up the spare room, you can start to fill that room up with boxes once you started packing up the other rooms; that way there aren’t boxes lying around for everyone to see for weeks on end. It will also help keep your house from cluttering up with boxes. On the top and side of the box, write a list of the contents that are in the box; what the products are and which room they belong to. The more descriptive these lists are, the easier the unpacking will be! We of course will be more than happy to pack your belongings for you; if you are taking advantage of our full service packing services, make sure you leave a box aside, with the essentials that will hold up through your last days at the old house, and the first few days at the new house. Every member of your family should have their own travel products; clothes, toiletries, food, prescriptions, etc. You should also put a side a box filled with blankets, linens, towels, toilet paper, soap, silverware, plates, cups, and maybe some all purpose cooking pots. Also, think about keeping a toolkit or toolbox handy, just in case you have to put furniture together at the new place.